PRICE REDUCED FOR QUICK SALE! Peace and Tranquility! Desirable Weatherstone community, Open Floor plan Block Home is Situated on a gorgeous 1/2 Acre plus Lot backing to a beautiful pond! Close to Down Town Safety Harbor & the famous Safety Harbor Spa, Philippe Park, award winning Schools & Mease Countryside Hospital, 10-15 Minutes to Honeymoon /Calidisi Island & Clearwater Beach. Large Kitchen with breakfast bar, high ceiling & 2 skylights opens to a gorgeous Family RM W/vaulted ceiling, floor to ceiling windows & a beautiful gas fireplace, Breakfast nook overlooking the lanai & pool. 4 Sliding glass doors leading to screened in lanai, large screened-in pool and a huge backyard overlooking beautiful pond & Nature. Elegant Living RM with vaulted ceiling opens to the formal Dining. Master suite with 2 walk in closets, sliders leading to the lanai & pool. Large master bath with soaking tub & separate shower. Split Bedroom floor plan built by Charles Rutenberg. Nice size laundry RM. New Tile Roof in 2011. Freshly Painted in 2018. Garage with extra space for Golf cart or Jet ski's. 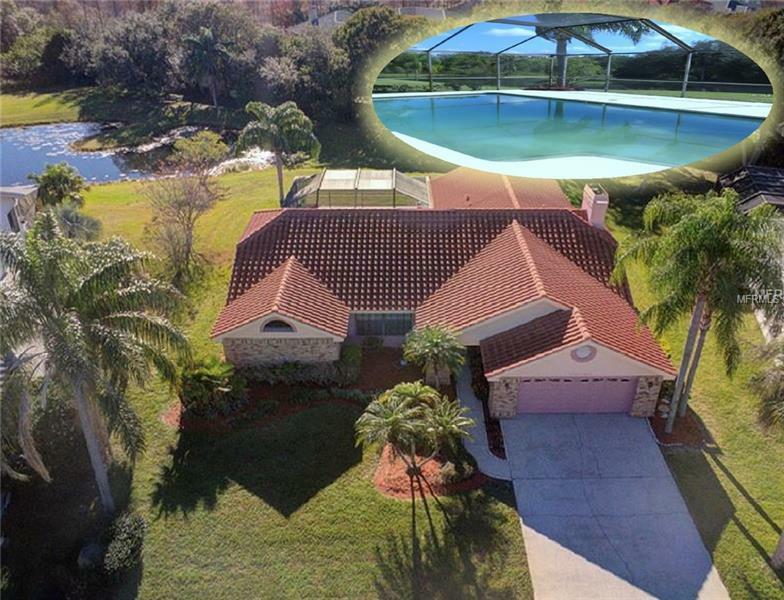 15- 20 Minutes to St Pete & Tampa airports, Well Built Home! Great Neighborhood! Motivated Seller says Bring all offers!